How can you find more work? How can you convert more proposals into projects? Tell your unique story to your target audience. That’s brand building, the essence of marketing. The best and maybe most important tool we have to accomplish this strategy is our website. When our potential clients start the process of seeking an architect, the first step is to search online for someone in their local region. Are you on the first page of Google? If not, you’re invisible. You need a website that can find its way to the first results of a search engine. When your prospects find your website, it has to be beautiful and clear, and it must tell your unique story as the first impression of your brand. We know you have so much to do and so little time. 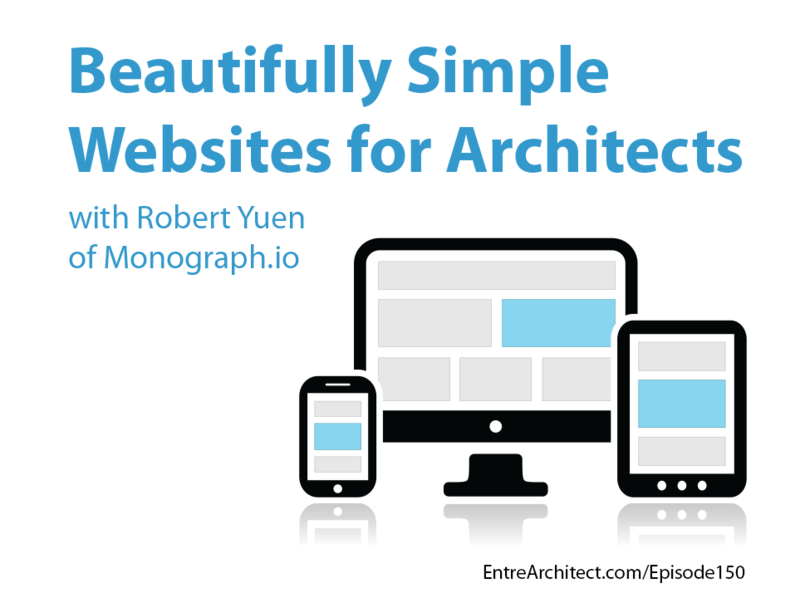 This week at EntreArchitect Podcast, Beautifully Simple Websites for Architects with Robert Yuen of Monograph.io. Monograph is a website builder with a concierges’ service. As three previous architects diving into technology, we’re trying to build specific tools for architects. Three months after being launched, we have 150 architects on board already. What inspired you and your partners to leave architecture and start a company providing services for architects? 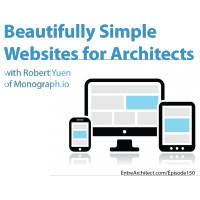 Robert and his two partners were usually in charge of building websites for the architecture firms they were at for the first five to ten years of their careers. When they got to know each other, they felt they had a larger value to give back as digital designers verses traditional architects. After doing that on a freelance basis for a while, they came together to form an agency to provide digital tools for project management, team management, and processes for the back end of websites. Monograph is the evolution of that work. Since often architects can’t afford the fees of an agency model but the need is there to have a great way to represent their work, they could leverage the same technology and put it into Monograph. What does Monograph offer that models like WordPress, Wix, and SquareSpace don’t? Monograph starts with a product and then incorporates a concierges’ service. That means that any client gets round-the-clock service from the team regarding resolutions, responsiveness, optimizations, SEO, digital representation, what is possible and what isn’t, etc. Monograph also allows a feature to categorize for architects, to show the different types of work. If you’re doing residential and small commercial work, you can categorize your projects into whatever section is relevant. A responsive website adapts to whatever device you’re using. If you change the size of your browser window and things don’t optimize, that means it’s static and doesn’t present as well as it could for a small business. How does Monograph work to get your website optimized so Google can find you? Fundamentally, Monograph is designed with a lot of things done automatically for every user. All the visuals and images are also pushed to the top as new clients may be looking for architectural inspiration. As a part of the concierges’ service, Monograph helps clients understand Google analytics and webmaster services, which essentially assess the website’s performance. Once the website is finished, how do you maintain and update it with Monograph? There’s no maintaining on the technical end, because that’s what Monograph does. If you want to update something, you just add a new project, upload the photos and text, and let Monograph know that you’ve got something new. The user interface is set up to be as simple as possible to use. Find Robert online at Monograph.io, Facebook, Twitter and Instagram, or get in touch with him at robert@monograph.io. For EntreArchitect listeners, receive $50 off the annual plan with Monograph from now until the end of the year!